If you've been curious about the Korean skincare wave - and sheet masks in particular, now you can get your fill stateside for very reasonable prices. Beauty 360 2-Step CO2 Brightening Serum and Face Mask is one of the new line of sheet masks from the Beauty 360 line. It's sold at CVS and CVS.com and all the masks are under $8.00. What's great about the Beauty 360 2-Step CO2 Brightening Serum and Face Mask is that it's targeted towards not one but two skin care concerns in one pack. The CO2 + Niacinamide Brightening Face Mask is a brightening face mask, which improves overall skin tone. The CO2 Therapy Spot Clear Patches, provide an extra boost to help clear breakouts and dark spots/discoloration. The acids and carbonates spread on the spot patches generate a large amount of CO2 upon contact with face mask, helping to improve skin's tone and appearance. 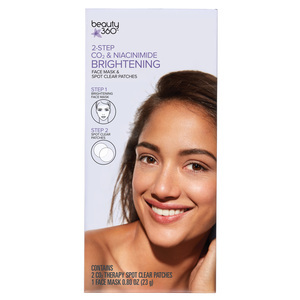 Beauty 360 2-Step CO2 Brightening Serum and Face Mask contains a brighten sheet face mask and clear spot patches. As directed, I applied the mask after cleansing my skin. I tore the mask along the dotted line to separate the sheet mask from the clear patches. Then I spread the mask over my face. It is a lightweight serum with a silky texture that spread easily on my skin. Finally I opened the patches and placed them on the areas on my face with darker spots/discoloration. I left the treatment and patches on for about 20 minutes and then peeled the patches off. There was a light layer of serum left on my skin, which I massaged further into my face, added any excess to my neck and decolletage. There's no need to rinse, so this is an ideal treatment before work in the morning, or before bed at night. My skin was plump, soft and smooth, and had a great glow. I loved the patches and have since used the treatment several more times to see some improvement in my overall skintone as well. I love that they are so inexpensive, you can stock up on several at a time or just buy as you need them. *This product was provided courtesy of Beauty 360 PR for reviewing purposes.